The plug-in card V618 is a 8-channel 24 bit enhanced A/D converter card for the input of analog signals into the VADIS system. The module operates with sample frequencies of 44.1 kHz or 48 kHz. 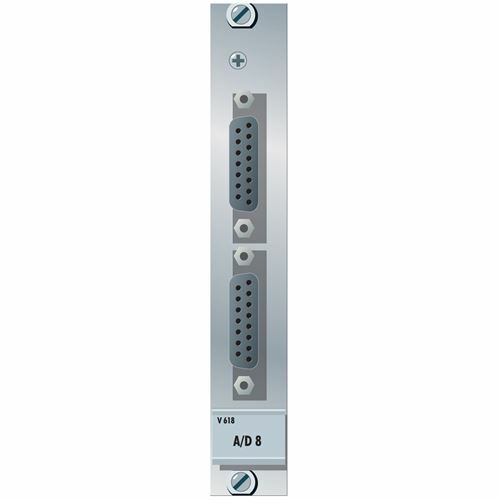 The input signals are fed into the VADIS system with a word length of up to 24 bit via symmetrical inputs. The analog input level at digital full scale is adjustable via jumpers to +12 dBu, +15 dBu, +16 dBu, +22 dBu or +24 dBu. Input Voltage Range +40 V max., -40 V min.